The hit musical comedies with cocktails serve up a treasure trove of pirate lore accompanied by traditional a cappella sea shanties to tell the story of rum and its most beloved drinks like daiquiris, hurricanes & pirate grog! 3 complimentary craft rum drinks are included! As A SPIRITED HISTORY OF DRINKING enters its fifth smash year as one of the 100 longest-running Off-Broadway shows of all time with over 700 performances, its producers have announced the return the show audiences have been clamoring for: RUM AND PIRATES, an expanded version of the production that originally ran exclusively on Hornblower Cruises. This edition will play at The Producers Club Theaters, and delves deeply into pirate life, legends, and history in addition to mastering rum and rum drinks – three of which are served during the performance! Join this unique company of performers, equally versed in education and entertainment, for an evening of cocktails, comedy, and a cappella sea shanties offered up with the kind of vibrancy that only THE IMBIBLE can deliver. Tickets are $85 for Orchestra Seating including three rum drinks, or $109 for First Class Seating on deck with a Guided Rum Tasting added, and can be purchased by calling 866-811-4111 or visiting Imbible.NYC. Join us for New Pirate Onboarding as we muster our crew for the maiden voyage of the Pirate Ship Bumbo! We'll cover everything there is to know about how to be a successful pirate, starting of course with the history, applications, and proper appreciation of rum. Follow this tropical spirit from its origins in Persia, through the pivotal role it played in forging colonial empires on both sides of the Atlantic by powering the infamous Triangular Trade, to the creation of classic modern-day drinks like the Daiquiri and the Hurricane. Along the way, you'll be treated to three complimentary rum drinks including authentic pirate recipes while you enjoy gorgeous, traditional sea shanties and experience a taste of life aboard a golden-age pirate ship – all woven into THE IMBIBLE's signature mix of comedy, science, history, and some of the best drinks in New York! RUM AND PIRATES is a can't-miss for all budding buccaneers seeking spirited adventure on the high seas! A limited number of First Class Tickets are available for each performance that include seating on deck with our crew, as well as a Guided Rum Tasting of silver, gold, and aged rums led by our Pirate Captain at the end of your journey. "A no-brainer - who turns down music, comedy, pirates and rum drinks?" 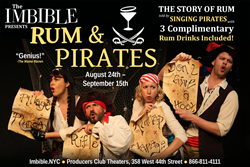 The cast of RUM AND PIRATES features Nicole DiMattei, Kate Hoover, Justin Chesney, and Stephen Scott Stark, with book by Nicole DiMattei and Anthony Caporale, a cappella vocal arrangements of traditional sea shanties by Josh Ehrlich, and cocktails created by Anthony Caporale. Producer and creator Anthony Caporale is an award-winning pioneer in the beverage world, internationally known for being the first to bring mixology to both YouTube, with his seminal web video series Art of the Drink TV, and then to the New York stage in THE IMBIBLE series. He is the founder and Artistic Director of Broadway Theatre Studio, as well as the Director of Beverage Research at New York’s award-winning Institute of Culinary Education. Anthony has appeared in over 600 performances of A SPIRITED HISTORY OF DRINKING, wrote and directed the three other IMBIBLE shows, and regularly appears on national TV programs like The Chew, The Dr. Oz Show, and FOX Money. He received a dual BSE in Mechanical Engineering and Materials Science from Duke University, where he also studied vocal performance. Anthony has served as the National Brand Ambassador for Drambuie Scotch Liqueur, the Cocktail Ambassador for Truvia Natural Sweetener, the Managing Editor of Chilled Magazine, and the host of Spoon University’s Mixology 101 video series. He is also the creator and host of the Taste Award-winning series "Broadway Bartender" on Broadway World, featuring interviews with actors, producers, and personalities from New York's Theatre District to give audiences a behind-the-scenes look at what it's like to live, work, and play on Broadway! 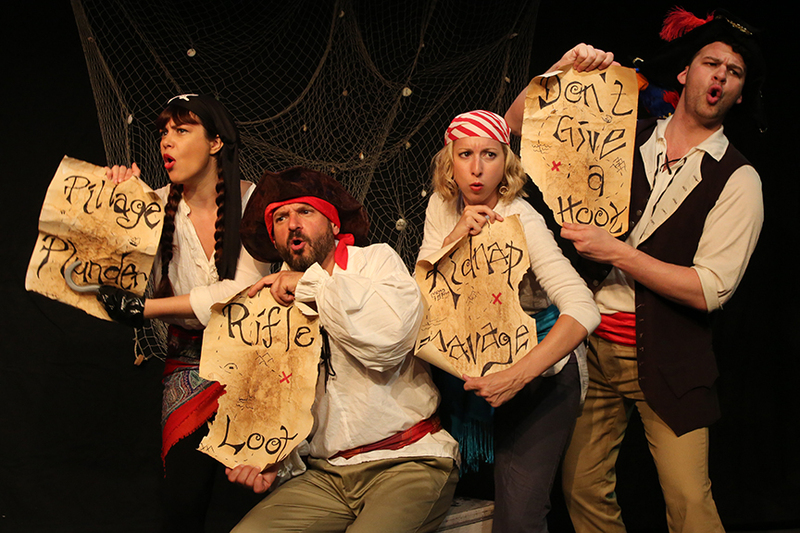 Performances of RUM AND PIRATES are 8PM Fridays, and 5PM and 8PM Saturdays. The Producers Club Theaters are located at 358 West 44th Street. 21 and over only with proper ID as three complimentary cocktails are provided. Rum and PiratesThe story of rum told by singing pirates! Rum and PiratesThe story of rum told by singing pirates!